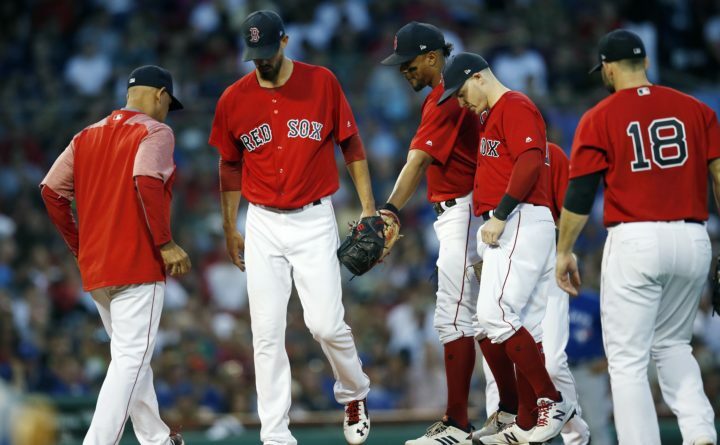 Boston Red Sox manger Alex Cora, left, takes out starting pitcher Rick Porcello, second from left, during the third inning against the Toronto Blue Jays in Boston on Friday night. BOSTON— Kevin Pillar had four hits and Justin Smoak had three, including a pair of homers, and they drove in four runs apiece on Friday night to help the Toronto Blue Jays beat the Red Sox 13-7 and snap Boston’s 10-game winning streak. Lourdes Gurriel Jr. had two hits — and two of Toronto’s four errors. Yangervis Solarte also had a pair of hits. The Red Sox led 1-0 after one and posted five runs in the second to make it 6-3, getting a two-run triple off the Green Monster from Betts to take the lead. But Toronto answered with five in the third against 11-game winner Rick Porcello on Smoak’s leadoff homer, Pillar’s two-run double and then the two-run shot by Smith. BORE-YUCKY: It was 8-6 midway through the second, with both starters already giving up a five-run inning. Borucki pitched to three batters in the fourth and was charged with seven runs — four earned — and eight hits. Porcello (11-4) was pulled after allowing the first five batters in the third to reach base; in all, he gave up eight runs and seven hits. TRAINER’S ROOM: Blue Jays: Vladimir Guerrero Jr. (knee) played his first game since June 6, with Double-A New Hampshire. He went 1 for 3 with a walk as the DH for the Gulf Coast League Blue Jays against the GCL Phillies. UP NEXT: Blue Jays: RHP Sam Gaviglio (2-3) goes for his first win since May when the series resumes on Saturday afternoon.